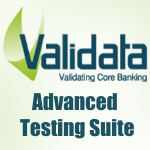 Validata Advanced Testing Suite (ATS) is an enterprise automated testing platform designed to test the complete TemenosT24TM software stack enabling you to efficiently and effectively manage your T24 projects reducing overall project cost and significantly improving quality. It is the most innovative solution for end-to-end automated testing , for core banking applications, supporting all types of testing from ISB Validation, Intelligent COB monitoring to Functional and Regression Testing with a library of pre-built reusable test assets and pre-built Test Analytics delivering superior ROI and optimizing business risk. Its model-based approach to test design enables clients to define test cases independently of technology and reduces testing times from months to days, eliminating at the same time the high cost of maintenance of traditional script-based test automation. End-To-End Automated Testing Capability: Functional, Technical and Continuous Regression Testing for Temenos T24™. A test engine which will gain application intelligence through its own built-in intelligence. Accurate real-time reporting through actionable Dashboards and advanced Test Analytics enabling end to end visibility across projects.